NETWORK FINALS: MODERN FAMILY, CHICAGO PD and SURVIVOR gained 0.1 in final numbers. 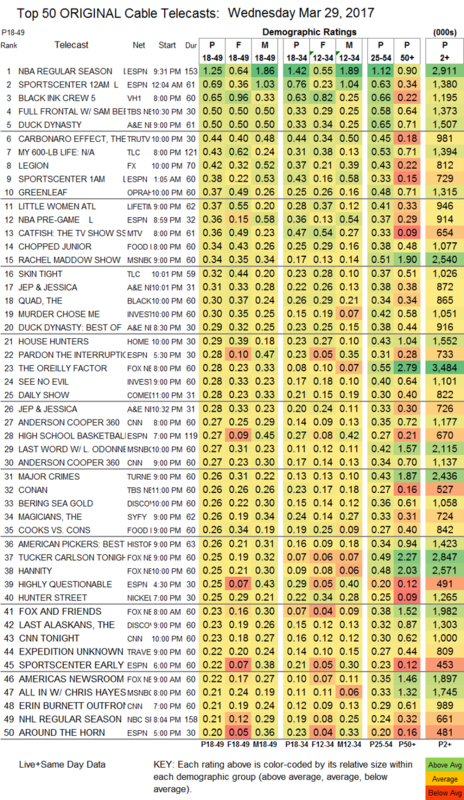 CABLE HIGHLIGHTS: The end of the line for A&E’s DUCK DYNASTY came with a handsome 0.17 bump to 0.50 (a “best of” clip show lead-in was at 0.29), with lead-out JEP & JESSICA at 0.31/0.28 compared to last week’s 0.25. 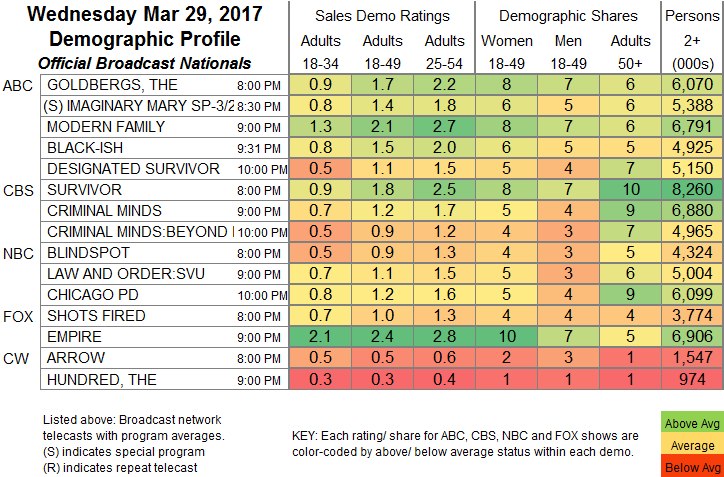 It was premiere night on TV Land, where LOPEZ returned at 0.10, and NOBODIES launched at 0.09. The season finale of FX’s LEGION rose 0.04 to 0.42. ESPN ruled Wednesday cable with a 1.25 score for its Golden State vs. San Antonio NBA game. VH1’s BLACK INK CREW dropped 0.07 to 0.65. TBS’s FULL FRONTAL was steady at 0.50. Tru’s THE CARBONARO EFFECT had a giant bump (perhaps a reader can explain why) to 0.44 from last week’s 0.17/0.16 for 2 episodes. On TLC, MY 600-LB LIFE gained 0.02 to 0.43, and SKIN TIGHT was down 0.03 to 0.32. OWN’s GREENLEAF ticked down to 0.37. On Lifetime, LITTLE WOMEN ATLANTA edged up 0.02 to 0.37, and BRINGING UP BALLERS was down 0.03 to 0.12. MTV’s CATFISH ticked up to 0.36. Food Network’s CHOPPED JR was at 0.34, and COOKS VS CONS was steady at 0.26. BET’s THE QUAD climbed 0.02 to 0.30. On HGTV, HOUSE HUNTERS was at 0.29. TNT’s MAJOR CRIMES ticked up to 0.26. On Discovery, BERING SEA GOLD fell 0.05 to 0.26, and THE LAST ALASKANS was also down 0.05 to 0.23. Syfy’s THE MAGICIANS added a tick for 0.26, and THE EXPANSE had a good-sized 0.06 bump to 0.17. WGNAmerica’s UNDERGROUND kept sinking, down 0.05 to 0.14. Spike’s TIME dropped to 0.12/0.11 from last week’s 0.17/0.15. Comedy Central’s THE COMEDY JAM was down 0.03 to 0.12. E!’s SO COSMO held at 0.07. POP’s SCHITT’S CREEK ticked up to 0.07. Proportionally speaking, Sundance’s HAP & LEONARD had a good night, with a 0.03 rise to 0.05.